This holiday season we are particularly grateful for the support of our volunteers, donors and advocates who help make our mission possible. 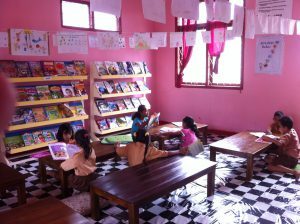 With the help of our partners at Room to Read, we have opened 8 more libraries in Eastern Indonesia, making a total of 37 libraries. It would have been impossible without the combined effort & dedication of everyone involved. 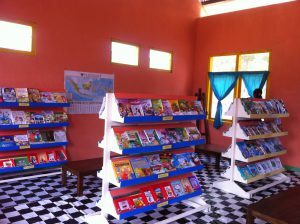 In addition to the new libraries, we have also renovated the libraries located in the Tomara village at South Halmahera, Melo village and Messah village in Flores island. 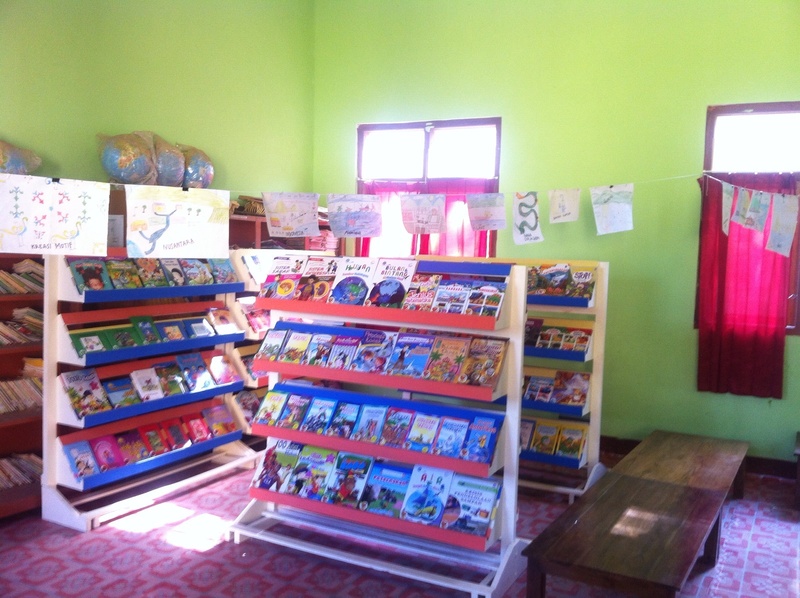 With the help of the local community, our volunteers replaced depilated books and equipment with new ones. 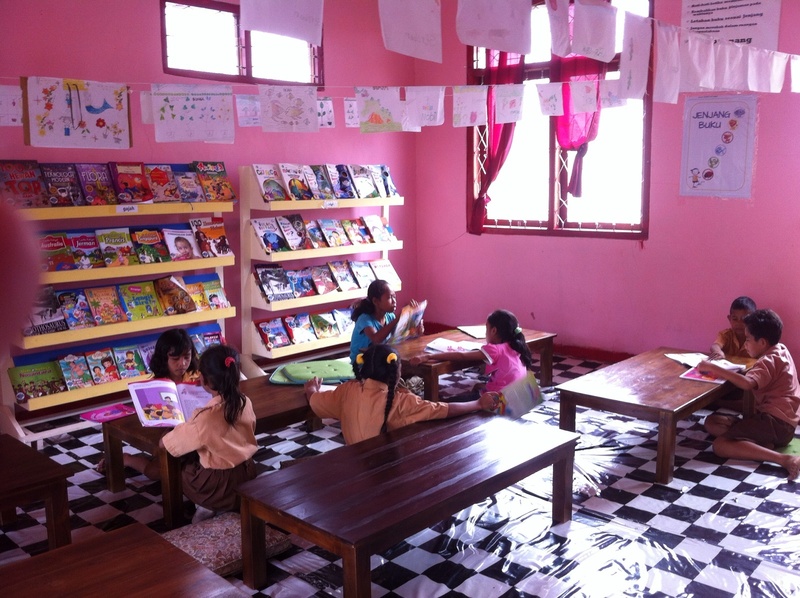 As the walls are repainted in brighter colors and new bookshelves are filled with new books, the libraries have become a friendlier and more comfortable environment for the children to spend their time at. 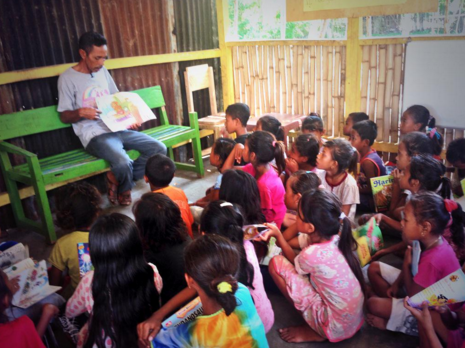 The story of our volunteer librarian at our library located at Rinca island, Pak Baco, has been nominated for Our Better World’s 2015 Good Story of the Year. Your vote would mean so much, as the winner will receive up to $10,000 to jumpstart our projects in 2016. To learn more about the campaign & Our Better World click here. Voting closes on 31 December 2015. This year we are blessed to have the support of our partners; Bobobobo, Bank Permata, Citibank, Room to Read, DILL Gourmet Cafe, Jakarta Players, Nestlé, Commonwealth Bank, Surfer Girl, Nutrifood, HotelQuicklyID, Mal Ciputra, GoJek as well as many amazing communities and individuals, whom without their support Rainbow Reading Gardens would not have been able to carry out our programs. We look forward to the opportunities that lie ahead. 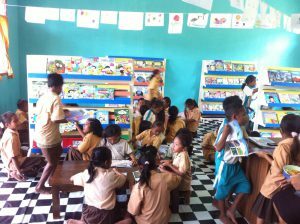 2015 was a great year for us and we hope to continue to work alongside our partners to deliver good quality children’s books to the children in Eastern Indonesia. During March 2015, Rainbow Reading Gardens was invited to be the beneficiary of Bobobobo’s program called “Teman Bobo Care” whereas proceeds of each Teman Bobo merchandise have been directed to our cause. In February 2015, Surfer Girl launched a “Share a Smile” campaign in collaboration with the Rainbow Reading Gardens. Through the “Share a Smile” campaign, Surfer Girl invited everyone to get involved in the process of creating a thousand scrapbooks by submitting their own motivational words. 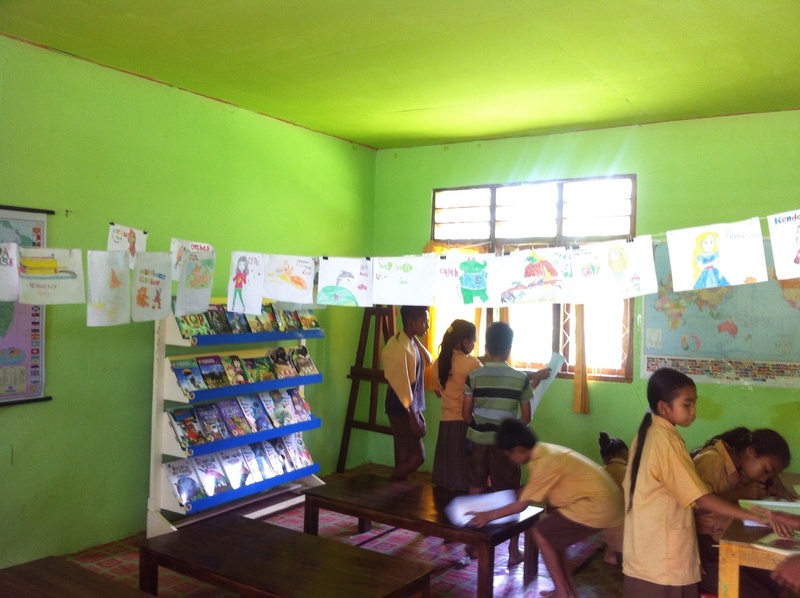 The scrapbooks have been sent to the children of the Rainbow Reading Gardens in Eastern Indonesia. 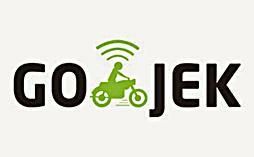 On May 2015, Rainbow Reading Gardens signed an MoU with Gojek as a symbol of collaboration between these two organisations. With this collaboration, Gojek supports the Rainbow Reading Gardens to transport any books or documents from/to/around Jakarta, Bogor, Depok, Tangerang, and Bekasi areas. Each year, different departments of the Commonwealth Bank in Jakarta are free to hold a social activity of their choice and make a donation to a preferred organization. 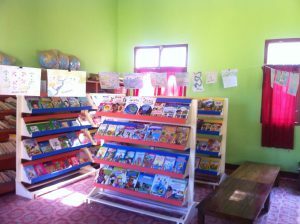 In 2015, the employees of the Internal Audit Department of the Bank decided to hold a two-day “Warung AMALia” charity bazaar, where 10% of the revenue generated from the bazaar was to be donated to bringing more storybook to the children in Eastern Indonesia through the Rainbow Reading Gardens. 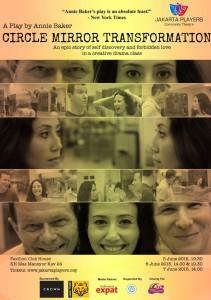 This year, the Jakarta Players held a charity play performing a play by Anne Baker dubbed, “Circle Mirror Transformation”. The proceeds from the production went to Rainbow Reading Gardens. One of our sweetest collaborations are with the wonderful KueKue Jakarta. By purchasing Kuekue Jakarta’s rainbow macaron, you are contributing to support Taman Bacaan Pelangi’s sweet missions in providing access to free books for the children of Eastern Indonesia. 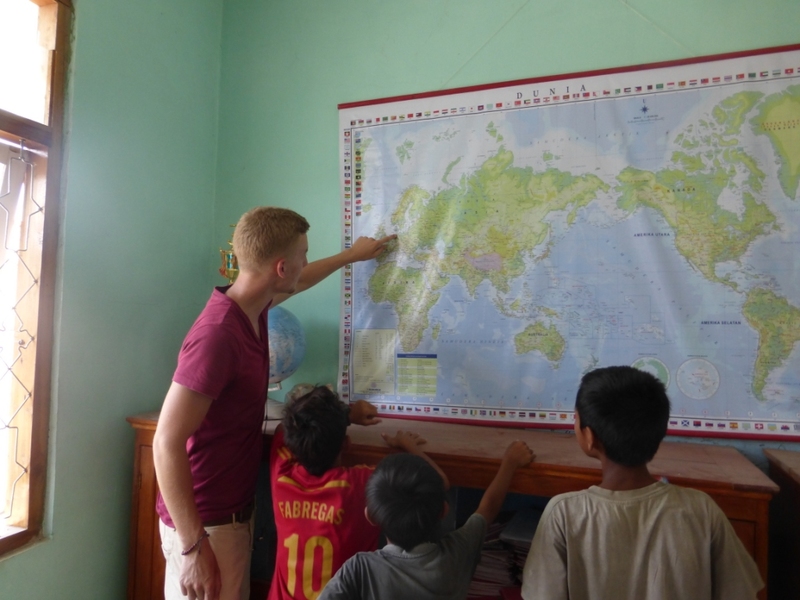 In 2015, Rainbow Reading Gardens received a generous book donation from Pacto Travel. 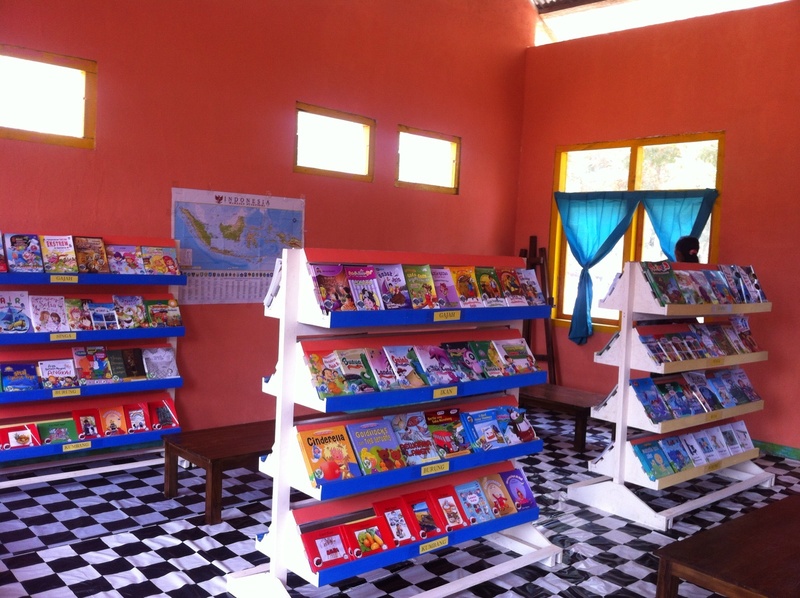 In total, Pacto Travel has donated 3000 books to our libraries. The National Breakfast Week (Pekan Sarapan Nasional, PESAN (which also means “message” in Indonesian) is a week-long national education campaign on the importance of nutritious breakfast. Through Berbagi PESAN, Nestlé aims to distribute 10,000 portions of nutritious breakfast among the children in various regions in Indonesia by partnering with, among others, the Rainbow Reading Gardens. 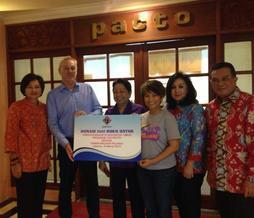 To commemorate the International Women’s Day, Citi Women Council donated Rp 100,000,000 to Rainbow Reading Gardens. 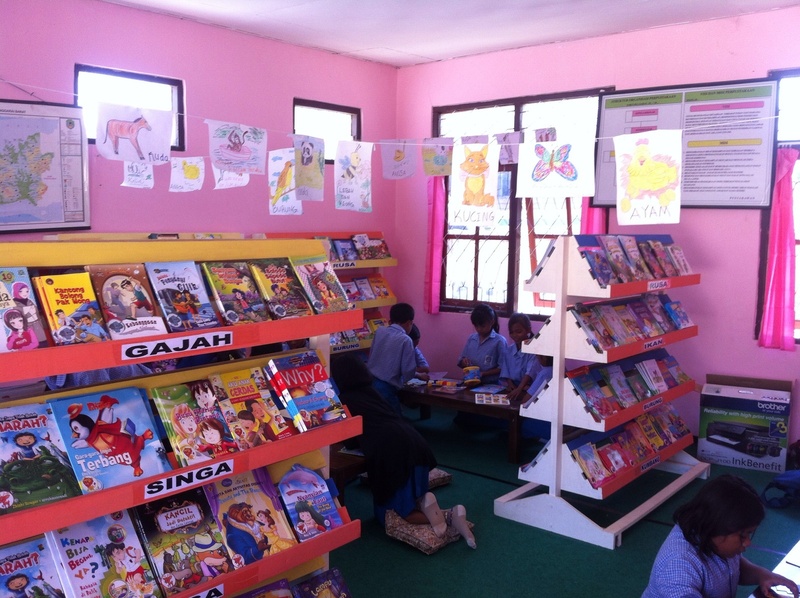 Half of the fund was allocated specifically for our library in Papua and the rest of the fund was allocated to provide more books to our libraries in other islands in Eastern Indonesia. 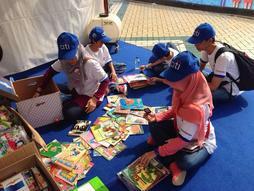 Not only that, through the “Book a Smile” program, Citibank Indonesia donated 1000 children books to the Rainbow Reading Gardens during its “Global Community Day”. Not only that. Upon receiving the books from the Citibankers, Citi volunteers and their families helped us on on our “Book Stamping” activities. Both children and parents participated in stamping the books, while making sure they are all suitable for Rainbow Reading Gardens’ children. 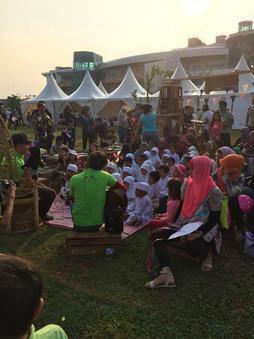 On November 2015, Pemata Hati, the CSR initiative of Bank Permata, invited Rainbow Reading Gardens to participate their UFE Goodness Village event. It was a great day as many people came with their families to enjoy a fun day picnicking in the sun. We’ve also received many book donations at our drop box corner. This year we also had our debut partnership with Hotel Quickly Indonesia. When people book a hotel via HotelQuickly app they instantly donate Rp 20.000,- that will be converted to 1 book. These books will be distributed through Rainbow Reading Gardens. 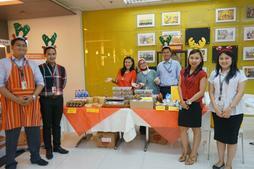 For the “A Gift to Give” program, Mal Ciputra has made 2 penny banks to be sold and distributed. Hundreds of nutcracker shaped penny banks will be sold for Rp 200.000 and the proceeds will be donated to Rainbow Reading Gardens. Hundreds of tin penny banks will also be distributed to children in schools for free. The children are expected to fill the penny banks and once it’s full, they will drop it off at a giant nutcracker penny bank located at Mal Ciputra. The idea behind this to cultivate a child’s empathy to the less fortunate children. In December 2015, Rainbow Reading Gardens has partnered with Granton Marketing Indonesia. For every voucher book of Rp 100,000.- that is sold, they donated Rp 5,000.- for Rainbow Reading Gardens.